Ever wondered what could be the best gift to give someone? How about something that would come in handy during the summer, winter and monsoon! Health and wellness products from Himalaya help you take good care of your skin and fight back against oily, dull skin and prevent infections. Himalaya offers the customers pet products, which are a great gift for your pet loving friends. All the Himalaya products are herbal and use organic substances. Every year, 200 million Himalaya products enter the homes of consumers around the world. With a range of over 300 healthcare and personal care products including brands like Liv.52, Cystone, and Bonnisan, Himalaya touches the lives of millions of customers worldwide. What better than healthcare products that help folks lead healthier, lives? Get your loved ones the best gift ever with Himalaya e-Gift Card. Grab other amazing deals and offers with GrabOn. Himalaya is a very well established and trusted brand and has been in service for its customers since 1930. Being a part of such a renowned group, Himalaya is known to provide the best service to consumers. You will not be disappointed by the quality and range of products available. You should definitely check them out if you are going to gift something related to healthcare and fitness. The e-Gift Cards are accepted at the online stores. There cannot be a better gift to give someone during the hot summers and cold winters! Be it a pet lover who needs herbal products for their pet or someone with a sensitive skin, Gift Cards from Himalaya have you covered. Himalaya offers authentic herbals products that is a great gift for your family and friends. Grab the best offers, deals and discounts on any purchase made on Himalaya. Get the hottest and the latest offers, coupons and promo codes from Himalaya that will help you save a ton while purchasing top notch herbal products. Grab the best Himalaya offers only on GrabOn! 1. What should I purchase a Himalaya Gift Voucher? A Himalaya Gift Card lets you buy health care products, all from one store. Himalaya provides pharmaceuticals, nutrition products, baby care products, animal care, home care needs and much more. The Himalaya Gift Cards are available in multiple denominations. They offer customized cards for special occasions and are also available for corporate gifting. 2. How do I buy Himalaya Gift Card? Enter the recipient details and a customized message, if required. Proceed and select payment option. Pay and complete your transaction. 4. What are the types of Himalaya Gift Card available? We have both e- Gift Cards and physical gift cards available, so you can choose either! 5. How will I receive my Gift Card(s) after purchase? Tell me about its validity. You'll receive your Himalaya gift card in your email within 24 hours from the time we receive your payment. For the validity of these gift cards, please refer to the terms and conditions to know more. 6. How can I redeem my Himalaya Gift Card? 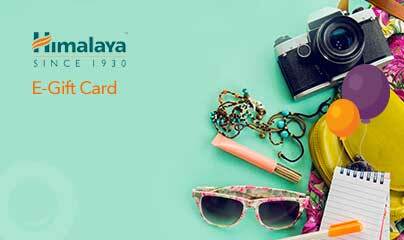 To redeem your gift card: choose to pay by Himalaya Gift Card option at the checkout screen. The enter your 16-digit Himalaya gift card number and the corresponding 6-digit PIN number. That’s all! 7. What happens if the transaction amount is lower than the balance in my Gift Card? You can only use your Himalaya Gift Card once. The gift card has to be redeemed fully and no partial redemption is allowed. So, if your cart total is lower than your gift card value, the remaining value on your gift card can’t be used for further purchases. 8. I used my gift card, but my transaction failed and my amount was deducted. What do I do? In such a case reach out to us as soon as possible and we will look into the matter and revert accordingly. Make sure to drop us an e-mail at giftcards@grabon.in or call us at 7997692233 and our team will get back to you. This e-gift voucher can only be redeemed at http://www.himalayastore.com/. The e-gift voucher cannot be used to purchase another e-gift voucher. E-gift voucher can also be clubbed with other promotions available on the website at that time. If the order value exceeds the e-gift voucher amount, the balance must be paid by the other payment modes.